-Lower level w/ full bedroom / bath and great room plus versatile hobby room and enough storage for all those things that we cannot part with!! -On site activities director and management – leave all the your cares behind and be on vacation every day! -35,000 sq. ft. clubhouse / indoor-outdoor pool, full gym, billiards, library, banquet room w/professional kitchen, hobby room, card room, putting green the list goes on and on. Additional Features and Amenities Join us and live the good life in Celebrate! 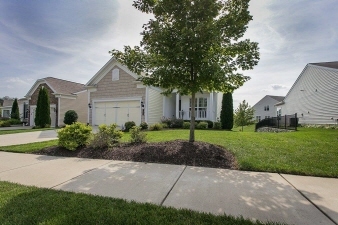 This impeccable Jefferson model with finished basement is ready for your white glove inspection! Whether you are relaxing on the front porch enjoying the view or grilling on the back deck, this home is sure to please! Live the vacation lifestyle with the on site activities and a clubhouse that you have to see to believe. The fun doesn't stop there with the gym, indoor/outdoor pool, billiards, and more! The main level of the house is perfect for everyday casual or formal living. The open plan living and dining room is perfect for every occasion and fits many lifestyles. Downstairs, the finished lower level family room is great for guests and to entertain friends and family. It also has a full bedroom and bathroom plus a versatile hobby room and storage!